Adeline Bird, vice president of Black Space Winnipeg, looks on as community members share their concerns and stories in response to Charlottesville. Approximately 200 people gathered at the University of Winnipeg’s Bulman Centre Wednesday to participate in Silence is Violence, a public forum aimed at establishing a community conversation on race and white supremacy and providing support for those in need to voice their concerns. 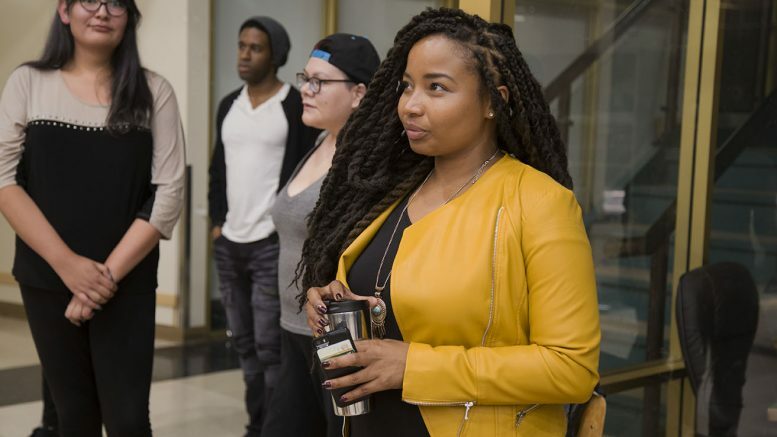 The event was hosted by Black Space Winnipeg – a local grassroots organization that aims to encourage dialogue and create safe spaces for people of colour – as a response to a shared concern regarding the events that took place in Charlottesville earlier this month when violence erupted due to clashes between white nationalists and counter-protesters. Following two days of unrest that included a white nationalist rally at the University of Virginia, protests turned violent when white supremacists clashed with counter-protesters, resulting in the death of 32-year-old Heather Heyers after a car was driven at high speed into a crowd of anti-racist, anti-fascist protestors. In Winnipeg, more than a dozen instances of anti-semitic graffiti have been discovered on benches and pavement along Wellington Crescent and in Omand Park in the past weeks, raising concerns among Jewish groups and local residents. Graffiti referencing the Ku Klux Klan (KKK) has also been spotted on the pedestrian bridge connecting the Forks and South Point Park. Adeline Bird, vice president of Black Space Winnipeg and host of the podcast Soul Unexpected, said she was not shocked by the graffiti. “None of this surprises people of colour,” she said. The event started at 6 p.m., and was initially open only to members of the BIPOC (black, Indigenous, and people of colour) community. An hour later, the doors were opened for others to join the conversation. Concerned members of the community stood in line to share their opinions, concerns, and stories with the rest of the audience. Kobra Rahimi, a recent graduate from the U of M’s Robson Hall Faculty of Law, also explained that the graffiti seen in Winnipeg was not surprising. But she added that she was particularly disturbed when she saw for herself the KKK graffiti at the Forks. Rahimi added that constantly comparing Canada to the United States blinds us to seeing the already existing hatred in Canada. “I don’t like that we always compare ourselves to the U.S., where we’re not that bad, where we didn’t have people on the streets with tiki torches, you know,” she said. “When you are raised with a certain ideology that you can get away with xyz – of course you’re going to stir things up, you’re going to be inappropriate, you’re going to be racist, you’re going to be misogynistic,” Bird opined. On what can be done in response to this, both Rahimi and Bird argued that allies and white community members need to take a stronger stance in calling out hate. “People are going to be upset, people are going to be pissed, people are going to be sad, mad, whatever, but we have to figure this out because we’re killing ourselves.